Welcome to my blog for the Heartfelt Creations July Alumni Blog Hop! Be sure to leave a comment on all the participating blogs. One participant will be chosen to receive a $25 Gift Certificate. The more you comment the more entries you get into the random draw! Be sure the check the Winner Announcement on Wednesday, August 2nd on the Heartfelt Creation Blog and on the Facebook Page. If you win, please send an email to Heartfelt Creations at socialmedia@heartfeltcreations.us and write "Winner of July Alumni Hop" in the subject line. Hop ends on Monday, July 31st at 11.59pm EST. Here's the birthday card that I made using the Wildwood Cottage Collection. It's the perfect collection for little girl's birthday cards and projects! What a sweet card!!! I love how you used the word die on the card base. 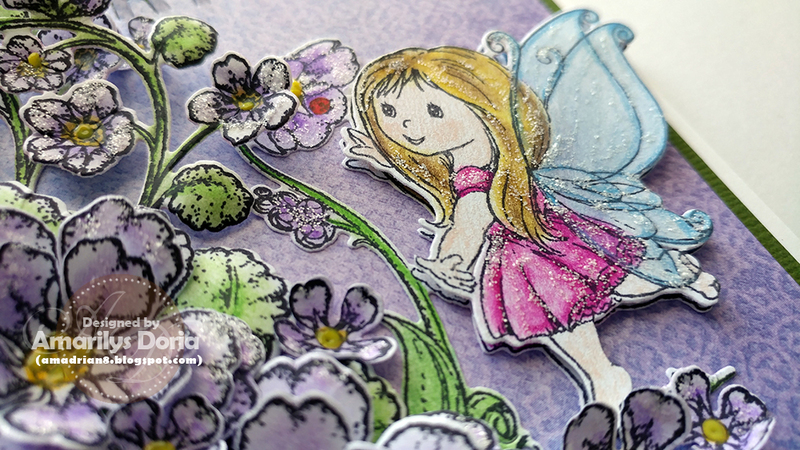 Such a sweet, sweet little fairy on this pretty card! I love the pop up greeting! Love the cute fairy on your lovely card. Amarilys, this is such beautiful layering of the Wildwood Cottage collection!! 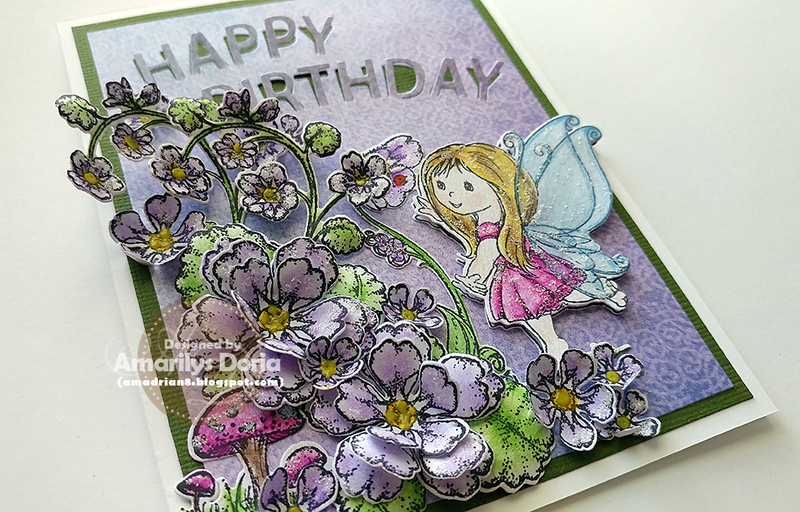 The fairy looks like she is dancing and the flowers jump right off the card! Gorgeously done! "You had me at Purple"
So sweet! Love the dimension on the flowers and that adorable fairy! Darling card with beautiful coloring! What a darling card! I love the flowers sparkling, cupped and popping up like that! This is darling! Love the card! How cute is this!!! I just bought this paper pad today at the Collinsville show! Can't wait to get started creating. Thanks for the inspiration! I love all the special details in your card. What a stunning birthday card! What a sweet card. Thanks for sharing it. So sweet! Looking to add more pieces of the cottage to my collection! Thank you for sharing! So cute! Can't wait to add more of the Cottage collection to my collection! Thanks for sharing! Such a cute and adorable card!! I love this collection. Love the sparkles, pop-ups and colors. Adorable card. Gorgeous card! 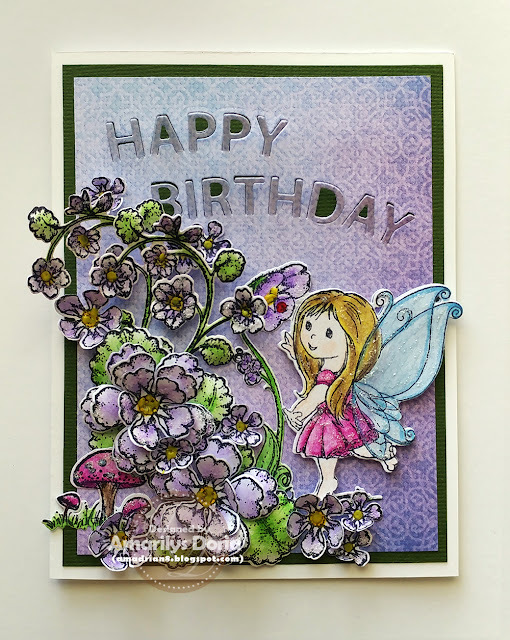 The colors are beautiful, the fairy too cute and I love how you did the letters for Happy Birthday.